As I'm travelling back on the ferry to Poole, what better time to share a few ghost signs that I found there on my last visit? Brittany has a huge range of regional specialities, most famously its pancakes. Here are a few of the sweeter local dishes. About as local as you can get, these gorgeous chocolates are only available in the town of Loudéac. Charmingly called 'dead branches from Loudéac Forest', each 'twig' is made of chocolate filled with crisp praline. 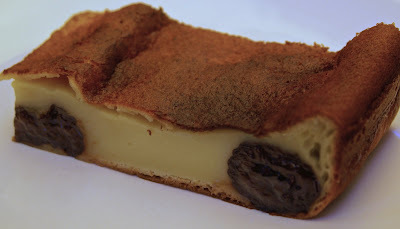 Moving on to the dessert section, the far Breton is available throughout the region. A sort of thick custard cake (but much nicer than that sounds), it usually contains prunes but also comes in other varieties such as apple. If eggs, milk and sugar aren't calorific enough for you, how about the fabulous kouign amann? Its name means 'butter cake', and the combination of butter, sugar and a light, flaky yeast dough make this a butterscotchy delight. In fact, it's so good that I ate it all before I remembered to take a photograph. Oops! (You can see one here, though). Incredibly, it was born out of economy: around 1865, when butter was cheaper than flour, extra quantities of the cheaper product were added and the kouign amann was born. Finally, the healthy option - strawberries from Plougastel. This town has a very special place in the history of the summery fruit: it's the birthplace of the modern strawberry. Until the eighteenth century, the only strawberries eaten in Europe were the small, wild kind. When Amédé Frezier left Saint Malo for South America in 1712, his main purpose was to gather intelligence on the Spanish fortifications. However, he also returned with a plant, the 'Chilean White', which produced much larger, paler strawberries than the European varieties. Unfortunately, this Chilean plant wasn't a great success - until someone had the inspired idea of crossing it with the native variety. The modern strawberry was born, generously-sized but red and tasty, and those grown at Plougastel are still considered to be among the finest. The English were among their earliest customers, buying them from 1854, while Parisians had to wait for the coming of the railway link in 1865. Plougastel then enjoyed a golden age, and in 1940 was still responsible for a quarter of France's strawberry production. Although there has been a decline in productivity since the Second World War, the strawberry and Plougastel remain inextricably linked and the town even has a Museum of the Strawberry! 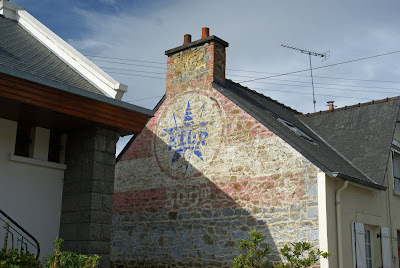 On my way out of the town of Guingamp, I passed through a single street with a whole assortment of ghost signs. Here are a few I managed to photograph through the car window. 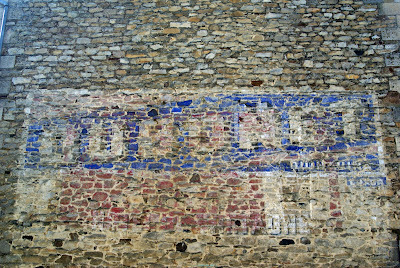 This sign is a palimpsest: a single wall with several images laid over each other. Here we have Suze's vivid colours overlaying Byrrh's more restrained tones. Like Suze, Byrrh is an aperitif. It is wine-based, and was originally sold as a tonic in pharmacies since it contains extract of cinchona bark (from which quinine is derived). It has never been popular in Britain, perhaps because its name sounds so like 'beer', but is still sold in France. Finally, this faded sign directs motorists to E Leclerc, the Brittany-based supermarket chain. The first branch was opened by Edouard Leclerc in his Breton home in 1949; within 10 years there were 60 stores. Not far from Langourla is a neolithic covered alley or dolmen, known as 'La Roche aux Fées' (the Fairy Rock) or 'La Grotte aux Fées' (the Fairy Cave). This name may seem rather unlikely, but according to local legend there were many fairies in the area who would come to the rocks at night and wash them in nearby streams. Perhaps they stole one of the rocks: the dolmen is unusual in not having a slab to cover its final chamber. The dolmen was originally 14.5 metres long and over a metre wide, made up of 35 stones. Such constructions were used as tombs, and are found throughout Brittany (including the much larger Roche-aux-Fées in Essé). Even the name owes its etymology to a Breton term: taol maen or stone table. Nonetheless, the purposes and building methods of these stone monuments remain largely obscure. Today, many sit semi-neglected in farmers' fields; I had to disentangle myself from a few brambles to get these photos! You can explore many of Brittany's megaliths on this great site. Think of a sociable French sport played outside in summer, and you’ll probably think of boules. However, in Brittany it could also be palets, which is particularly popular in the east of the region. Rather than a pitch, you just need a square piece of poplar wood; stand 5 metres back, throw the maitre (jack) onto the board and then the two opponents or small teams attempt to get their palets as near as possible to the maitre. The team which gets a palet closest to the jack wins; they get a point for every palet which is nearer to the jack than their opponents’. While each game may carry as little as a single point, you need to get twelve points to win the match. 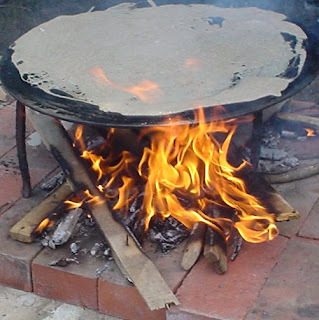 Sounds simple, but since the palets are discs of cast iron which tend to slide or bounce off the board when they actually hit it, there is plenty of skill involved. Once you’ve got the hang of keeping your pieces on the board, you can play tactically, trying to knock your opponent’s palets out of the way. Small variations in your palets – age, weight, curve – can all make a difference; and if you enter competitions, you’ll want to mark your palets to ensure that you get your own favourites back. This rather formal equipment is a relatively recent invention (dating back a century or so). Before that, games of this type were played on earth, with the players throwing stones. In some parts of western Brittany, games are still played directly on the road, although the simpler equipment tends to be matched with more complex rules. Happily for the palets novice, tradition among the players of this convivial game is that the winners buy drinks for the losers! With a huge project like the Nantes-Brest Canal, one of the major problems was finding a workforce. Initially, with the Napoleonic Wars still raging, Spanish prisoners of war seemed to be the answer. Given poor living conditions and frequent epidemics, it's unsurprising that many of the prisoners deserted. When construction began again after the wars, French convicts were used instead. In particular, prisoners from Brest and Belle-Ile were sent to the small town of Glomel to cut the canal into a hillside, creating 'the Great Cut'. The channel they had to excavate was over 3km long, 100m wide and 23m deep; they moved an incredible 3 million cubic metres of earth in 9 years. The forced labour was hard: digging out mud and earth using picks and shovels, carrying it away on foot, and spending the night huddled in primitive shacks built of mud and thatch. Working conditions were appalling and many workers died from epidemics, especially cholera. Even the hope of a pardon in return for their efforts was not enough to keep the men from revolting in 1830 and 1832. Eventually, in 1834, the camps were closed following a cholera outbreak and local people carried out the remaining work. Looking at the peaceful canal today, it's hard to imagine the misery involved in its construction. The Nantes-Brest Canal is both an amazing achievement and a failure. First, the achievement. When the British blockaded Brest harbour during the Napoleonic Wars, Napoleon himself decided that a canal linking it to Nantes would minimise the impact of such blockades. Engineer Guy Bouessel planned the works, which lasted from 1811 until 1858. (The fall of Napoleon held things up for a while). Just over 360 km (224 miles) long, the canal crossed the sometimes hilly terrain of central Brittany with the help of 236 locks. And the failure? By the time the canal was completed, the military need for it was gone: it would never serve its intended purpose. Even its peacetime use was limited, as railways took over much of the freight transport, although barges did carry wood, sand, slate, fertilisers and wheat. Worse was to come: the construction of the Guerledan barrage and lake in 1928 cut the canal in two. It even submerged 17 of the locks! Happily, the canal has enjoyed something of a renaissance. It is now a popular holiday destination for pleasure boats and canoeists and, along the towpath, cycling and walking. Classic French food isn't generally known for its use of spices, but chef Olivier Roellinger has made them an integral part of his cuisine. In doing so, he invokes the history of the Saint Malo area: the corsairs brought not only wealth but also spices to the region. They traded as the 'Compagnie des Indes Orientales de Saint Malo' - the Saint Malo East Indies Company - with cargoes of pepper, ginger, nutmegs, cloves, cinnamon and cardamom. Based on that history, Roellinger has developed a cooking style which combines local produce, seafood and spices, and which has won him three Michelin stars. Roellinger's restaurant is in his childhood home, a malouiniere in Cancale where the famous corsair Robert Surcouf played as a child. Malouinieres are seventeenth- and eighteenth-century houses built by wealthy ship-owners who wanted country homes within a short ride from Saint Malo. Thus, they could enjoy the peace of the countryside away from the overcr owded walled town, yet still keep a careful eye on their businesses. Although constructed in local stone, most of these houses are rendered; this, along with a high roof, gives them an elegant and distinctive appeareance. 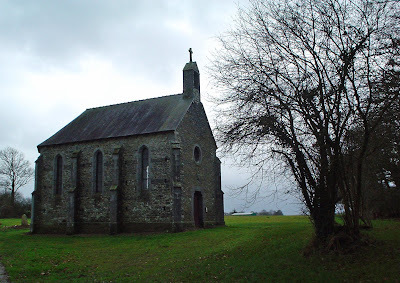 Many have dovecotes, chapels and formal gardens; some are open to visitors. The restaurant is amazing, and fully deserves its renown. However, if you can't make it to Cancale for a meal there, you can buy Roellinger's spice mixes. Wonderful in their own right, they also evoke a lesser-known aspect of French culinary history. Jean V de Beaumanoir may look peaceful here on his tomb, but a nearby plaque explains that he suffered a gruesome death at the hands of Rollan Moysan and Geoffroi Robin on valentine's day 1385; they acted on the orders of Pierre de Tournemine. According to a contemporary description, Rollan killed him with two blows of an axe to the head. Jean's brother swore vengeance, and carried the body to the chapel at Lehon where it lies to this day. Unfortunately, the plaque does not give any more of the story. However, Pierre fought a duel with Jean's brother the following year, while the Duke of Brittany and his court looked on. He obviously survived, because he went on to marry Jean's widow Typhaine who has her tomb in the same church. Suze is an aperitif distilled from gentian roots; it was invented in 1885 and officially launched in 1889, the year the Eiffel Tower was built. Since this advert was painted, advertising of alcoholic drinks has been severely limited by law. 1910: Rachel and Margaret McMillan established the Deptford Clinic. It provided dental and surgical help to children attending local schools. Believers in the value of outdoor life for children, they also provided night camps for boys and girls, where children could wash, wear clean nightclothes and sleep in the open air. Later, a garden nursery was opened. Both sisters had been born in New York and raised in Scotland. They spent much of their adult lives in London; as christian socialists and campaigners for women’s suffrage, they were committed to working in deprived areas. Their particular area of interest was the health and education of young children, which they believed to be crucial to overcoming the effects of poverty. Before opening their pioneering clinics in Deptford, Bow and Peckham, they had already successfully campaigned for the provision of school meals, arguing that adequate nutrition was essential for children in compulsory education. Rachel died in 1917. Margaret went on to found the Rachel MacMillan College in Deptford in 1930: she believed that nursery teachers should be properly trained, so the college offered a three-year course. (It later merged with Goldsmiths’ College). She also wrote books on education throughout her life. Not only did the sisters change ideas on nursery education in Britain, but their work still has an impact on Deptford. The Rachel McMillan Nursery is still running today, while the former college site is now student accommodation but still has Rachel’s name. in certain localities ... the custom of the hoteliers is to serve oysters without price supplement, a custom which does not exist at Cancale, where on the other hand one can eat these molluscs all year round. Indeed, the Romans were fans of the oysters, and Louis XIV had them brought to Versailles daily. The distinctive flavour is due to plankton specific to the bay of Mont St Michel. This shallow bay is also responsible for the design of a boat particular to the town: the bisquine, which is shallow-bottomed. Oyster fishing was strictly controlled to protect the wild stocks – it took place once a year in an event known as the ‘Easter Caravan’ - but farming of the molluscs was also practised. Since the fishermen also took part in deep-sea fishing and were away for at least half the year, the main burden of selling the catch fell on their wives. At low tide, women and children would go out to the parks to collect and sort the shellfish. Hundreds of women were engaged in this work, and are now commemorated by a fountain in the middle of the town which depicts them rinsing the oysters in baskets. Cancale remains famous for its oysters and has a small market on the sea front, the perfect place to try them with a squeeze of lemon and the scent of fresh sea air. 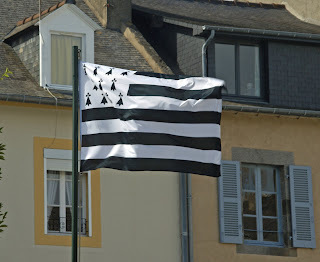 All around Brittany, you can see the distinctive gwenn ha du (‘white and black’) Breton flag. It is a relatively recent invention, although the elements of its design are far older. Morvan Marchal, a Breton nationalist, created it in 1925. By 1927, it was adopted by the Breton nationalist groups as the flag of Brittany. Today, it can be seen in all sorts of locations including official buildings. The five black stripes symbolise the ancient bishoprics of Upper (eastern, Breton-speaking) Brittany: Dol, Nantes, Rennes, Saint-Brieuc and Saint-Malo. The four white stripes represent the bishoprics of Lower (western, Gallo-speaking) Brittany: Cornouaille, Léon, Trégor and Vannetais. The top left section of the flag is ermine on a white background. The ermines are the symbol of the Dukes of Brittany. The order of the ermine was created by Duke Jean IV in 1381, in memory of the battle of Auray where – thanks to British support – he triumphed over the French-backed Charles de Blois. It was the first such Breton honour, and unusually, was open to both women and men. Legend has it that Jean IV chose the ermine as his symbol after hunting one through the countryside. When it came to a muddy stream, the ermine turned to face its pursuers rather than soil its pelt by crossing the dirty water. Seeing this, he spared the animal and took as his motto ‘Plutôt la mort que la souillure ‘ – ‘better death than a stain’. Still trying to spot the ermines on the flag? When ermine was used to decorate shields, the white skins were sewn together side by side, and the black-tipped tail placed in the middle of each where it was fixed by three stitches in a cross shape. This became the stylised heraldic symbol seen now on the gwenn ha du and elsewhere. We remember that Drake sailed around the world, but perhaps not why. The purpose of his voyage was to attack the Spanish: the Queen saw him as a privateer, but to Spain he was no more than a pirate and a large reward was offered for his capture. His voyage in the Golden Hind was helped enormously by his capture of Spanish charts, and even a Spanish captain experienced in navigating South American waters. He also took more traditional treasure of gold, silver and jewels. Drake had departed from Deptford in 1577, visiting St Nicholas's Church before he left. The Golden Hind returned to Deptford in April 1581 and Elizabeth I came onto the ship for dinner. Impressed by the value of his cargo (she was entitled to a half share) and his achievement in being the first Englishman to circumnavigate the globe, she knighted Sir Francis on board. (Pointless bit of trivia: his actual dubbing with the sword was carried out by the French ambassador the Marquis de Marchaumont, not the Queen herself). No peeping before you've tried the quiz here! The four departments of Brittany are Cotes d'Armor, Ille et Vilaine, Morbihan and Finistere. See them on a map here. Nantes is a historical capital of Brittany and its castle was home of the Dukes of Brittany. Administratively, it is now part of the Loire region. Galettes are traditionally eaten on a Friday - the meat-free day of the week. Ouest France, which covers Brittany, Normany and the Loire, has an amazing 42 editions. The English name for the hortensia is hydrangea. Argoat means 'land of woods'. Mathurin Meheut was a twentieth-century artist, whose work includes many depictions of Breton daily life. Cap Frehel has two lighthouses, one dating from 1701 which sits alongside its much larger modern replacement. Jules Verne was borne in Nantes in 1828. Asterix lived in a village which the books locate near the modern town of Erquy. Much of the eastern part of Brittany has a regional language, but it’s not Breton. Gallo is not a Celtic language like its neighbour, but is part of the same Romance group of languages (ie those descended from Latin) as French. Because of their similarity, Gallo is often wrongly assumed to be a patois or dialect of French; it’s actually a separate language in its own right. However, it has suffered the same suppression as Breton, a long process which began in 1539 when the Villers-Cotterêts Decree made French alone the official language of the country. Although the purpose of that law was to end the use of Latin, its side-effect was to downgrade France's other languages. By the seventeenth century, regional languages were relegated by the state to the status of patois. In the twentieth century, compulsory education was in French and aimed to dissuade children from speaking other languages. The state’s attempt to eradicate languages such as Gallo and Breton involved discouraging a huge proportion of the country from speaking their mother tongues: French was the language of the regions around Paris, while most of the rest of the country spoke a range of regional languages. However, as speaking French became a mark of education and modernity, other languages were often simply not passed on from parent to child. The numbers of Gallo and Breton speakers declined sharply from the 1950s. Nobody knows for sure how many people still speak Gallo, since the language is not officially recognised (France still has not raftified the European Charter for Regional or Minority Languages). Even in the region it has a much lower profile than Breton, despite being the language of its capitals Rennes and Nantes. Although it tends to be perceived as a dying language spoken by older people, younger people are learning it and it is taught in many local schools. Poets, novelists and cartoonists are writing in Gallo, which also has a strong oral and musical tradition, and there is an annual festival. You can learn it here; there’s lots of information in languages including English here. Try your hand at these questions, answers in a few days! Which four departments make up Brittany? No longer officially part of Brittany, this town is in fact its ancient capital. Where is it? On what day of the week are galettes traditionally eaten? How many local editions does the newspaper Ouest France publish: 8, 26 or 42? The hortensia is the emblematic flower of Brittany. What is its English name? Who was Mathurin Meheut, born in Lamballe: a writer, artist or composer? On Cap Frehel, you can find several landmarks including Fort La Latte and two _______ standing side by side. Which author, whose novels include Around the World in 80 Days, was born in Nantes? Which cartoon Gaul lived in a village near Erquy on Brittany's north coast? Degemer mad (welcome) to today’s post! Even in the Gallo-speaking areas of eastern Brittany, you don’t have to go far to come across the influence of the Breton language. To take one example, many place names begin with lan, which indicates a parish dedicated to a saint. Thus Langourla is the parish of St Gourlay. As a Celtic language, Breton has similarities to other languages such as Welsh and Cornish. It declined under compulsory French education and the hostility of central government to regional languages. The number of speakers fell by three-quarters over the twentieth century, and UNESCO considers Breton to be in danger of extinction. However, there is an ongoing revival, and Breton language education now thrives in the Diwan schools. The French state has even just recognised that ‘minority languages belong to France’s heritage’. If you want to find out more about the language, there’s lots of information in French and Breton here and here. Fancy learning it? You can attend a course in Brittany or online. Let’s end with a toast: yec’hed mat! Good health! Not all of St Malo’s seafarers were corsairs seeking gold. 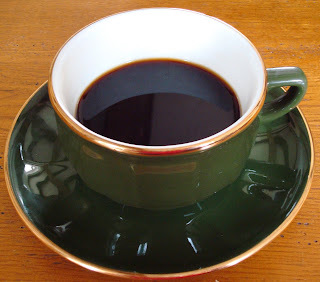 In 1707, two ships from the town left for Moka (or Mocha), a Yemeni port where the Dutch and English bought their coffee. Although some coffee was already imported via Egypt to Marseilles, it wasn’t sufficient to meet the growing demand for this fashionable beverage. Dealing direct with the merchants of the Yemen might make good sense, but was not going to be easy. To reach Moka, the Breton sailors had to travel via Spain, around Africa past the Cape of Good Hope, and up to the Red Sea. Not only was the journey long and arduous, but England and the Netherlands were at war with France so they had to evade enemy ships too – two were captured en route and added to the expedition. Scurvy, an attack on an expedition to collect fresh water, and errors in navigation also caused problems. Finally, a hurricane separated the four ships, but all made it safely back to St Malo with their valuable cargo - thirty months after departure. A second voyage in 1711-13 achieved even greater success. The ship’s surgeon was able to cure an abcess in the Imam al-Mahdi Muhammad bin Ahmad's ear, and the St Malo ships were entrusted not only with beans but also with coffee plants. These thrived on Réunion, and later on Ile Maurice, further supplying the French demand for coffee. Brittany’s most famous specialities are its various forms of pancake. Most of us are probably familiar with the sweet crêpe, a light pancake delicious with sugar and lemon or Nutella. It’s also the basis of French classics such as crêpe Suzette. However, this is only one variety of Breton pancake. Bretons also eat galettes with savoury fillings; their brown colour comes from the use of buckwheat flour. Buckwheat grows on poorer high ground and was introduced to Brittany in the fifteenth century, apparently by Saracens – hence its French name, sarrasin. It makes a darker, slightly heavier pancake than the wheat-flour crêpe. Popular toppings are ham, cheese and egg (a galette with all three is known as a complet), but there are plenty of more imaginative alternatives: sardines, mushrooms, onion, even andouille sausage. For food on the go, the galette saucisse is always popular. A sort of Breton hot dog, it’s a galette wrapped around a barbequed sausage. Crêpes and galettes are made on a flat billig, and a swirl of the wooden rozell spreads the batter thinly and evenly. In Breton, both types of pancake have the same name: krampouezh. Pancakes cooking over wood fires are a familiar sight at many summer events in the region; there’s usually a bar nearby selling local cider to wash them down with. The galette should be thin and ideally a little crispy around the edges. Crispiest of all, though, are crêpes dentelles: biscuits made of lace-thin sweet crêpes, often coated in chocolate. A wide range of these biscuits are made by Les Gavottes of Dinan. 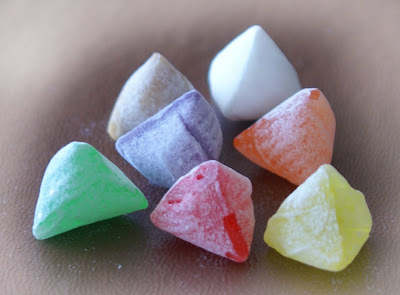 The sweet delicacies reputedly originated in the sixth century when a hermit, St Corentin, prepared them for King Gradlon, but their modern origins go back only to 1886 when Marie Thérèse Cornic made them in Quimper. Myths aside though, they’re a delicacy well worth seeking out! Underground steam - worse than today's commute? The first locomotives were run by the Great Western Railway, so it’s unsurprising that some features of the underground trains mirrored their open-air counterparts - not only carriages with compartments and luggage racks, but also the fare structure. Like normal railways, the underground initially offered first, second and third class travel; there were also special cheap ‘parliamentary’ fares for workmen on early morning services. Parliament had forced the operators to offer these, partly to compensate the people forced to move to make way for the building of the underground.. In 1873 the fare from Paddington to Notting Hill Gate was 4d first class, 3d second class, 2d third class and 1d with a parliamentary fare. 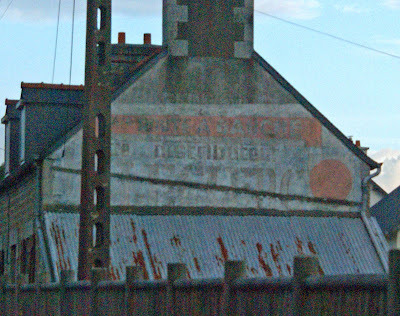 Like London, Brittany has its ghost signs. They don't seem to be as numerous or as elaborate as those found in some other regions of France, but are pretty appealing all the same. With their particular style and brand names like Suze, they couldn't be anywhere but France. One of my current favourites is this Dubonnet advert, with the product name mis-spelled! 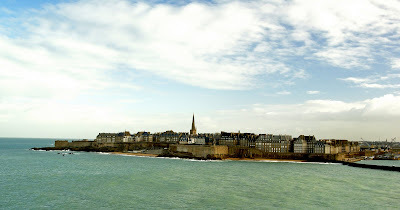 As a walled town surrounded by sea, St Malo must have made a tempting home for pirates. Since the sea is full of rocks and difficult for outsiders to navigate, it was better still. Their position improved even further when, like Britain's privateers, they became state-licensed: no longer pirates but corsairs. At a stroke, they were transformed from evil robbers at risk of being hanged to patriotic warriors harassing enemy shipping. Indeed, St Malo still describes itself as the 'corsaire city'. The crucial difference between a pirate and a corsair was that the latter had a letter from the King of France (although Brittany was independent, France found that these St Malo mercenaries were a valuable supplement to the French navy). It authorised them to act against enemy shipping during wartime, and should ensure that if captured they would be treated as prisoners of war rather than as pirates. They were mainly deployed against the English, especially during the Hundred Years War when they played an important role in disrupting trade through the English Channel. They later fell out of royal favour, but experienced a resurgence in the seventeenth century under Louis XIV. In 15 months from May 1702, St Malo's corsairs took 181 ships and 137 cannon; the town was known as the richest in Europe. Spoils were divided, with 10% going to the admiralty, 60% to the shipowner and 30% to the crew. This golden period saw two of St Malo's most famous corsairs: Duguay-Trouin and Robert Surcouf. Both have statues in the town today. Duguay-Trouin was born in 1673 and his parents intended him to become a priest, but after a period of debauchery while studying in Caen he returned to St Malo and became a corsair - although he suffered from sea-sickness for the whole of his first voyage. However, he showed real flair for the work and soon became a captain - no easy job, since crews were always ready to revolt. After taking many English and Dutch ships, he sailed to Rio de Janeiro in 1711 with a small fleet of ships to capture the city from the Portuguese. He succeeded in doing so after a hard fight, and then, having released a number of French prisoners, sold the city back to Portugal for a hefty price - reputedly the greatest corsair victory of all time. Surcouf's most famous victory was the taking of the Kent, an enormous ship belonging to the East India Company. His much smaller force overwhelmed the crew and 400 soldiers on board, killing the captain with a grenade. The prisoners were then taken by another ship to England, where they would be exchanged for French prisoners; meanwhile, Surcouf had to throw his cannons overboard to escape English pursuers and return safely to St Malo with the booty. However, unwilling to give half the gold on board to the government as required, he preferred to throw it into the sea. Corsairs would enjoy a final resurgence during the Napoleonic wars, but were now widely seen as immoral. Under pressure from the English, they were abolished in 1854. Nonetheless, a corsair ship, the Renard, is sailing from St Malo once more - but only on pleasure trips!